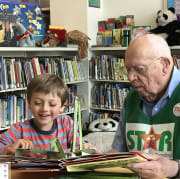 STAR (Story Telling and Reading)volunteers share their love of reading with children for 2 hrs/wk, making books come to life and early literacy exposure fun. STAR is a Los Angeles Public Library program that brings children and adults together from diverse cultural, ethnic, and socioeconomic backgrounds to share in the joy of reading. When children read books one-on-one with a STAR volunteer, they improve their reading skills, enrich their imagination and develop a life-long love of reading. Become a STAR reader and MAKE A DIFFERENCE IN A CHILD'S LIFE! Volunteers needed for Wednesdays from 4-5pm. Bilingual in reading highly desired.